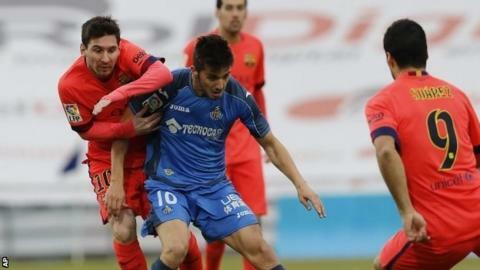 Lionel Messi hit the woodwork as Barcelona wasted a host of chances in a goalless draw at mid-table Getafe. The result means they will not go into the short winter break as league leaders, as they trail Real Madrid by four points and have one game left. Messi failed to add to his record 256 La Liga goals but went closest, hitting the crossbar with a free-kick early in the second half. The visitors, in characteristic fashion, dominated but were wasteful in front of goal with only two of their 23 efforts on target, despite Messi and Luis Suarez playing the 90 minutes. Midfielder Xavi said: "There is a long way to go still but it's a step backwards. "It was the kind of game we usually cope with but if we don't break the deadlock things get tricky. We have a lot of good goalscorers up front but today the ball didn't want to go in." Match ends, Getafe 0, Barcelona 0. Diego Castro (Getafe) is shown the yellow card. Second Half ends, Getafe 0, Barcelona 0. Foul by Diego Castro (Getafe). Attempt missed. Álvaro Vázquez (Getafe) right footed shot from long range on the right misses to the left. Assisted by Míchel with a headed pass. Xavi (Barcelona) wins a free kick in the attacking half. Foul by Pedro León (Getafe). Offside, Getafe. Mehdi Lacen tries a through ball, but Álvaro Vázquez is caught offside. Munir El Haddadi (Barcelona) wins a free kick on the left wing. Foul by Juan Valera (Getafe). Álvaro Vázquez (Getafe) wins a free kick in the defensive half. Attempt blocked. Lionel Messi (Barcelona) left footed shot from outside the box is blocked. Assisted by Andrés Iniesta. Attempt blocked. Andrés Iniesta (Barcelona) left footed shot from outside the box is blocked. Attempt blocked. Luis Suárez (Barcelona) right footed shot from the right side of the box is blocked. Assisted by Xavi. Substitution, Barcelona. Adriano replaces Dani Alves because of an injury. Mehdi Lacen (Getafe) wins a free kick in the defensive half. Substitution, Barcelona. Munir El Haddadi replaces Pedro. Attempt blocked. Jordi Alba (Barcelona) left footed shot from outside the box is blocked. Assisted by Sergio Busquets. Substitution, Getafe. Pedro León replaces Yoda. Diego Castro (Getafe) wins a free kick in the defensive half. Foul by Mehdi Lacen (Getafe). Substitution, Getafe. Diego Castro replaces Ángel Lafita. Attempt missed. Lionel Messi (Barcelona) header from the centre of the box is close, but misses the top left corner. Assisted by Jordi Alba with a cross. Substitution, Barcelona. Andrés Iniesta replaces Ivan Rakitic.